As Laura drives down the road that leads up to the Aquatic Center, Lucy is already jumping around in the car. 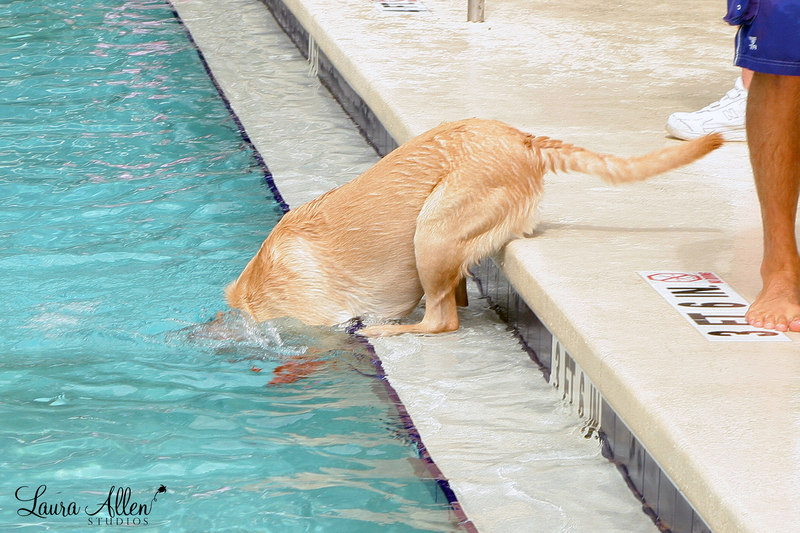 Florida municipalities, hip on the dog revolution, open up their public pools for dog swims at the end of their swim seasons. 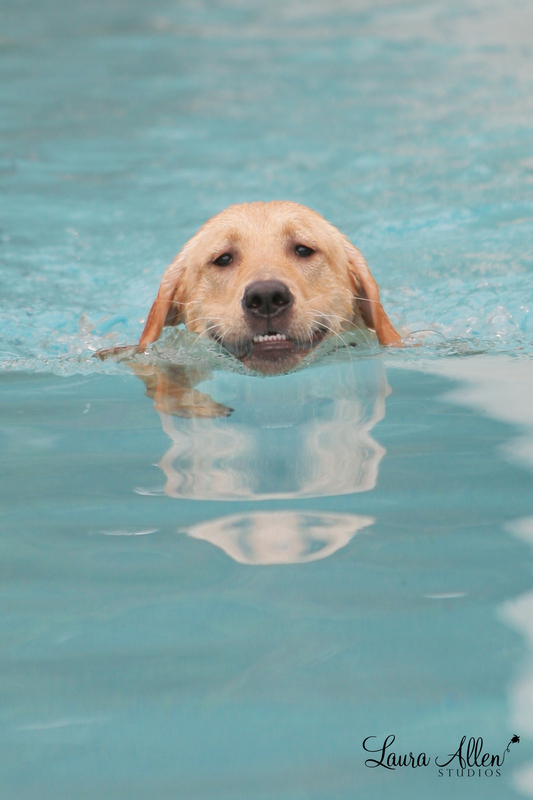 Public pools in Fort Lauderdale, Largo, St. Petersburg and Tampa have been doing it for several years now, much to the delight of their canine citizens. On Saturday, November 5, the City of Tampa hosts Drool In The Pool Doggie Paddle at Copeland Park Pool in North Tampa (11001 North 15th Street). There is a $5 per dog charge. Humans enter free (but no humans are allowed in the pool). Next Saturday at Largo’s Highland Family Aquatic Center, the annual Soggy Doggy Splash Party will be from 11a-1p (400 Highland Avenue). There is a bonus day on Sunday from Noon-3p. Again, this is strictly a dog swim. No humans are allowed in the pools. Lucy, a Labrador Retriever who lives with her human Laura Allen, loves the Soggy Doggy Splash Party. The following is an excerpt from a feature that appeared in the Fall 2012 edition of The New Barker dog magazine. As Laura drives down the road that leads up to the Aquatic Center, before even seeing the other dogs or the pool, Lucy is already jumping around in the car. When the gates to the pool open, this dog is ready for some serious play time. She takes off with the other dogs, barely looking back at Laura. Occasionally, Lucy will look up and around for Laura, just to make sure. She gives Laura a reassuring smile before going back to playing. Lucy and Oliver. Oliver and his human drive from South Tampa each year to attend Largo’s Soggy Doggy Splash Party. Photograph by Laura Allen Studios for The New Barker dog magazine. Lucy is the life of any party and has never met another dog she didn’t like. One moment she is relentlessly flirting with her best friend, Catahoula mix Oliver, adopted from the Humane Society of Tampa Bay. The next moment, she’s taking her toy to another human she doesn’t even know, coaxing him to throw it. No one can resist Lucy’s charm or her invitation to play ball. No one. She will continue to pick up and drop the toy in front of a stranger, until he finally picks it up to throw it into the pool. Mission accomplished, and off she runs. Throw My Toy. Now. “I don’t know you. But, throw my toy and we will be BFF,” coaxed Lucy to a stranger. Photograph by Laura Allen Studios. Toy-driven and focused, Lucy will dive down three to five feet in the water to retrieve a toy. She loves swimming with Laura in the Gulf or in a swimming pool, so she has definitely honed her aquatic skills. 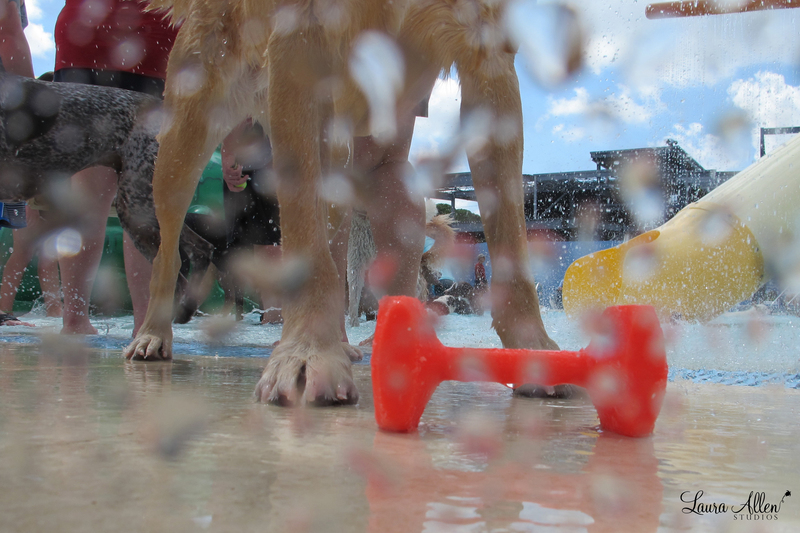 That came in handy during the 25-yard swim, another event held during the Soggy Doggy Day Splash Party. On this particular day, there was a massive start at the relay, as the dogs all jumped in the water at the same time. Every dog was swimming in all directions. Every dog, that is, except Lucy. With an almost inaudible whistle from Laura, Lucy quickly spotted her mark at the other end of the pool, and was soon cutting through the water like an arrow. Of course it didn’t hurt that Laura held one of Lucy’s toys in her hand. 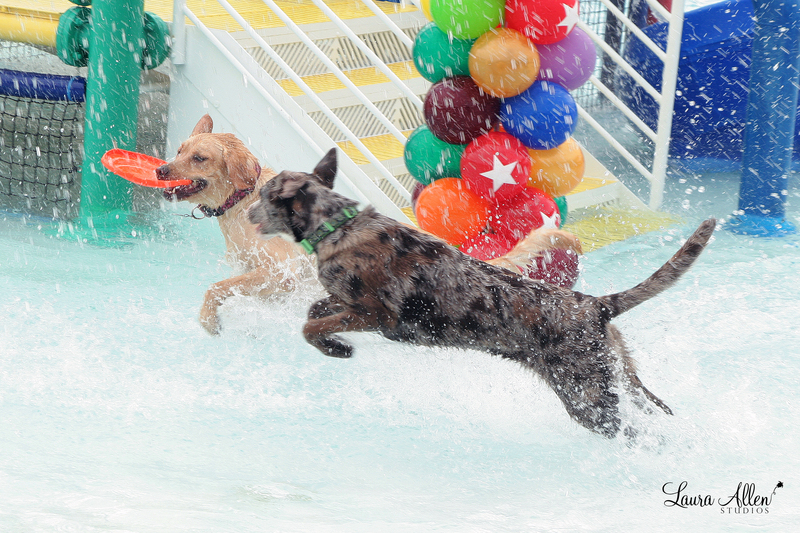 Advantage: Team Lucy, winner of the 2013 Soggy Doggy Splash Party 25-yard swim. Should I Stay Or Should I Go? Lucy checks out how far down her toy is before diving in after it. Photograph by Laura Allen Studios for The New Barker dog magazine. Lucy embodies the complete and utter joy of a dog, and Laura brings the best of that out in her. They go almost everywhere together when Laura is not working on location or on assignment as a professional photographer. Laura, who completely appreciates our domestication of dogs as a society, also believes dogs should be allowed to be dogs. Like children, dogs sometimes like to get dirty, and roll around in the grass, or mud. Laura believes in taking it all in stride. “If I know we’re going to a place where Lucy will get dirty, I just make it a bath day. I try to live in the moment, just like Lucy does, and to not stress about the little things,” said Laura. Lucy. The Belle of the Ball. Photograph by Laura Allen Studios for The New Barker Dog Magazine.